I’m here, I’m here! I arrived in Astoria, Oregon last night after a long slog cross-country from Miami. I met FisherPoet (FP) Steve Schoonmaker and Ron McDaniel, our resident Cowboy (https://www.facebook.com/pages/Cowboy-on-the-Side/140325332754121?v=info&sk=info) at the airport and we all piled in a rental car and headed out of Portland. Ron kindly removed his cowboy at for the ride so I could see out the passenger side window as I drove us to Astoria. It was great getting to hang out with both of these highliner FPs! I also finally got to meet Tele Aadsen, who writes a blog titled Hooked http://nerkasalmon.wordpress.com/tag/tele-aadsen/. We’ve been following each other’s blogs for months now and it was great to finally put a face with the name. She’s making her maiden voyage this year at FPs. Go get ‘em Tele! The event kicked off last night with a welcome dinner and open mic at Clemente’s, a local restaurant here in downtown Astoria, OR. The dinner menu included Willapa Oysters, Poke, Bristol Bay Sockeye Salmon and Chips, Oyster Casino, and what I had, Local Fresh Halibut and Chips. Well folks, the engines are all warmed up and we are about to put it into gear! The official event kicks off tonight, Friday at 6 PM. There is lots going on this year with about 10 different venues, a silent auction, workshops, onsite poem contest, films, open mic, story circle, and a photo exhibit titled When Crab Was King, Faces 1950 to 1982 by Toby Sullivan of Kodiak. More details can be found at the Fisher Poet Website at http://www.clatsopcc.edu/community/fisherpoets-gathering. They are on Facebook this year at https://www.facebook.com/FisherPoets?sk=wall and on Twitter at FisherPoets. More about each FisherPoet can be found at Pat Dixon’s In the Tote: http://web.me.com/dixonphoto/Fisher_Poets_-_In_the_Tote/Welcome.html. Oh, and I'll be live on the radio today, Friday at 3:20 Pacific Time on Arts! Live and Local on KMUN. I think you can stream it live at coastradio.org. Saturday night at Clemente’s is a special event to raise awareness of the proposed Pebble Mine at the heart of the world’s largest salmon run up in Bristol Bay. The event features FisherPoets with Bristol Bay connections and a reading by author Bill Carter. Proceeds from a silent auction as well as a percentage of food and drink sales(way to go Clemente’s!) goes towards Trout Unlimited’s Save Bristol Bay Campaign: http://www.savebristolbay.org/. I hope to see you there! I leave you with a poem I wrote for the fundraiser event tomorrow night. It’s an offshoot from Walt Whitman’s I will take an egg out of the robin’s nest. I will take a sockeye salmon out of Bristol Bay. I will ask you to weigh their value. 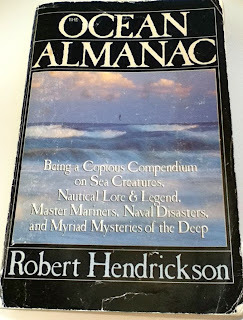 As I prepare myself for the up and coming Fisher Poets Gathering in Astoria, OR, February 24-26th, I turn to my favorite book for inspiration: The Ocean Almanac. 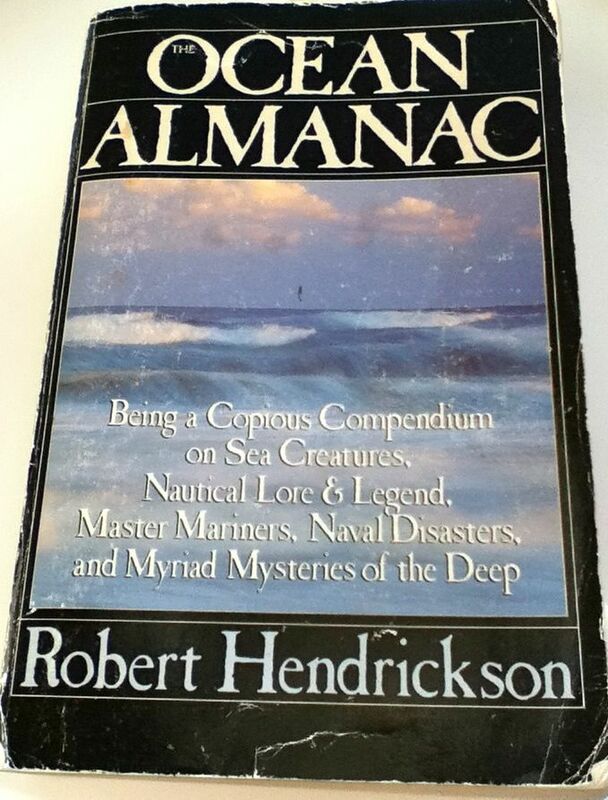 Being a Copious Compendium on Sea Creatures, Nautical Lore & Legend, Master Mariners, Naval Disasters, and Myriad Mysteries of the Deep by Robert Hendrickson. If you are a fisherman or mariner, or like the ocean in any way, shape, or form and don’t own it, I insist you stop what you are doing right now and find yourself a copy. I think the best place this day and age is Amazon.com. the sea was made for his tomb. There are fathoms of these, and other poems, rhymes, flotsam and jetsam, which are, by the way, referred to the goods that were found floating on the sea and belonged to the Crown and cargo purposely thrown overboard in order to lighten the ship in an emergence, respectively. One obese oafish octopus occupied on opium and oarlocks occasionally obediently oared oarsman, oarswomen objectifying, obscene oarsmanship and ogles opening oysters on outboards of obtuse oceanic odysseys. The silliness continues a few more lines, but you get the idea. It’s still a work in progress but I’ll let you know when its ready. 2012 FisherPoets Gathering is coming! The 15th Annual FisherPoets Gathering in beautiful downtown Astoria, Oregon is right around the corner. It kicks off at 6 PM Friday February 24 and goes until Sunday afternoon. The FisherPoets Gathering is an Astoria tradition, bringing folks in the commercial fishing industry together to share original poems, stories, songs, memoirs, essays and art in celebration of the work and its folks. (http://www.clatsopcc.edu/community/fisherpoets-gathering). Check out their Facebook page at (https://www.facebook.com/FisherPoets?sk=info). This event has been on my radar for years. Last year, I decided to finally make it happen but instead of just being a spectator, like a normal person would, I took the bull by the horns. I performed. My first act was at the biggest venue, live on the radio. No pressure. I walked up on stage and those lights blinded me and my mind went blank. Completely blank, like a deer in headlights. Good thing I wrote down what I was supposed to say. “Hi, my name is Jen Pickett and I’m a commercial fisherman.” Once I started reading my script, I eased into it a bit and it was smooth sailing after that. I had a wonderful time and met some wonderful folks. I’m looking forward to this year's event and I’ve been working hard on some new stuff to read. So if find yourself in the Astoria area the last week in February, stop on by! See you in Astoria! But, here is a sneaky peak, this one’s for you, Suzie! Howard could be found each morning having breakfast at the CoHo until 7:30 AM. We caught him just as he was leaving. Howard owned the one and only boom truck in Cordova and he was pushing 80 years old the summer this all happened. Howard always dressed as a logger, wearing Carhart jeans with buttons for suspenders, suspenders and a wool vest. He was a cheerful man, had a smile for everyone but was a deaf as a door-knob. I told him that while trying to haul my boat out, my trailer unattached itself from the truck and went in the drink. “Did the truck go too?” he inquired, sounding a little like Mr. Magoo. 11 AM sharp Howard comes around the corner with his boom truck. The same time the NAPA BBQ started. The same NAPA BBQ that the whole town shows up for. Well, I guess that day they got more than they bargained for, they got a free show. Nothing like have the whole town witness your mistakes. Howard backs his boom truck down to the bottom of the ramp where the cement is slick with moss and salt water slime. And since Howard has a commercial truck, it beeps the whole way down the ramp grabbing everyone’s attention incase they didn’t notice the big truck in the first place. I was standing on the dock, mortified. At low tide the trailer is mostly out of the water but not close enough to the ramp that a pick-up would be able to back up to it without going in. Howard got the truck into positions, set the feet, and stabilized it. By now, there is a line of by standers, all munching on hotdogs, lined up along the water’s edge for the show. Howard reaches out with his boom and hooks the trailer. His truck picks up my several thousand pound trailer like it’s a Tonka Toy and proceeds to raise it a good thirty feet into the air for everyone to see. I hear from somewhere in the crowd “Hey Pickett! That your trailer?” I nod. “Truck go in, too?” I shake my head. Everybody seems to be asking me that today.